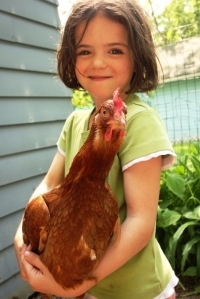 Kara Cicerchi held one of her familiy's chickens during the first Cleveland Heights Chicken Coop Tour. Photo by Gabe Schaffer. The Heights Bicycle Coalition formed in July 2010 to promote a more bicycle-friendly city, McDonald’s passed the first of several hurdles to opening a location in University Heights, and a “fracas” at the annual Coventry Village street fair marked the beginning of the end for that long-standing hallmark of summer. Intern Lewis Pollis wrote about the 16 arrests made at the 2011 Coventry Village street fair and the introduction of a new juvenile curfew proposal in the July 2011 Observer. The street fair has now been replaced by a successful music and movie series in Coventry P.E.A.C.E. Park, but the curfew remains in three Cleveland Heights business districts: Coventry Village, Cedar Lee and Severance Town Center. In July 2012, intern Yelena Tischenko wrote about the Dog Project, and how a group of Cain Park Neighborhood residents changed a longstanding ban on dog walking in Cain Park. Their goal was to “encourage more neighborhood activities in the park” in order to “reduce crime, increase foot traffic and encourage more families to spend time in Cain Park.” Intern Philip Hewitt encouraged Heights resident to “shop local” in support of the many independent merchants that add character to our community, while intern James Helmsworth wrote about the creation of the 11th National Register historic district in Cleveland Heights, and intern Christina Sanders introduced us to Culture of Cutting, a new business in the Cedar Taylor Business District that is still thriving today. Intern Alastair Pearson wrote in July 2013 about two new businesses that established themselves in the Heights: Cleveland Cinemas, which moved its offices from Solon to the Cedar Lee Theatre Building, and Lee Silsby Compounding Pharmacy, which moved into the former fire house at Lee and Silsby. Intern Camille Davis introduced us to Cleveland Heights’ new city manager, Tanisha Briley, while Editor-In-Chief Kim Sergio Inglis told us of Superintendent Heuer’s resignation, just four years after accepting the position to lead CH-UH schools. Cleveland Heights also offered its first Chicken Coop Tour, documented by photographer Gabe Schaffer. Articles in the July 2014 issue remembered Rebecca Alison Meyer, a Fairfax Elementary School student who died at the age of 6, and celebrated the naming of Cleveland Heights’ first teen poet laureate, Moonisa Halim. A year later, the July 2015 issue recognized the completion of several Fairfax Elementary School playground projects, including a Little Free Library, built to honor both Meyer and 10-year-old Trishka Tantanella Holcomb, who had also died the year before. The issue also covered several new initiatives within the Heights community: a citizens group formed to “keep CH water public;” Peggy Spaeth, former Heights Arts director, began a new nonprofit, Sober Living Cleveland, to provide housing to recovering addicts; FutureHeights launched its Neighborhood Mini-Grants program; and Shannon Morris founded Artful Cleveland, to give Heights artists affordable studio space on Cleveland’s East Side. The July 2016 issue covered Jason Hallaman and Emily Bean's purchase of Mitchell’s Fine Chocolates, enabling a longtime Heights business to continue serving the community. Columnists Carla Rautenberg and Deborah Van Kleef, who began writing during the fight to keep Cleveland Heights’ water public, called to the community’s attention the fact that the city’s building department, which had once had 16 staff members, was now outsourced to a private company called Safebuilt. Intern Connor O’Brien wrote about Cleveland Heights City Council taking action against the operators of the Arco dumpsite in East Cleveland in the July 2017 Observer. Other articles dealt with such issues as streetscape construction delays necessitating moving the annual Cedar Fairmount festival to the fall, Noble Neighbors hosting a workshop about the future development of the Noble Triangle (Mayfield Road, Noble Road and Warrensville Center Boulevard), and MetroHealth Medical Center expanding its Severance facility with the addition of a short-stay hospital.